Should we cancel a trip and you have already paid, you will be refunded. Please cancel 7 days in advance as per our cancellation policy. Should you not arrive for your trip, you will be billed. Sharks are wild animals and their presence cannot be guaranteed. In the event that there is no shark activity while on a shark cage diving tour with Marine Dynamics, then a voucher will be offered. This voucher is not transferable – your name and passport number will be recorded on the voucher. If a shark has been sighted from the boat, we will consider that a successful trip. In the event of illness, hospitalisation, accident or death (with the necessary proof and discretion of management) a full refund will be considered. The vehicle transfer fee is non-refundable. We can guarantee a marine biologist on board who will educate you on our favourite apex predator and other shark species seen. 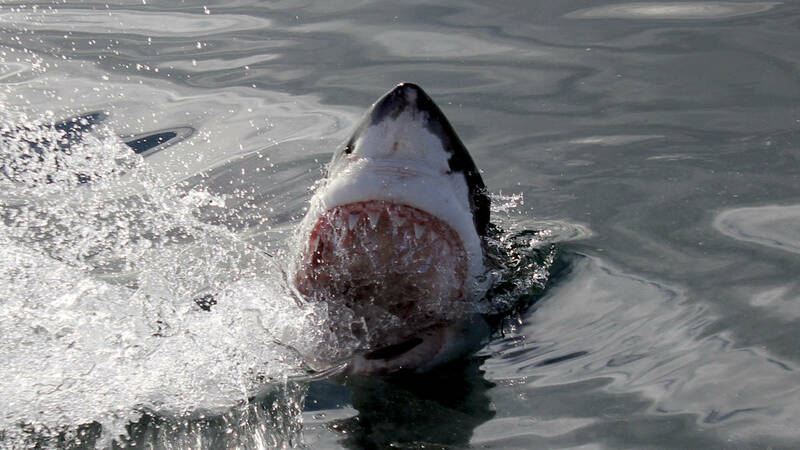 Remember that YOUR CHOICE MAKES A DIFFERENCE and you can be assured that by booking with us you are assisting in the research and conservation of the Great White shark. Do you have any of the following medical conditions our crew should be aware of? Epilepsy/ Seizures, Asthma, High Blood Pressure/ Heart conditions, Diabetes, Other? Please inform our reservations team, so we can take good care of you. Guests must sign an indemnity form prior to the activity thereby acknowledging that the activity is undertaken at own risk. Any unaccompanied minor (under 18 years of age) requires the indemnity to be signed by a parent/legal guardian prior to the activity. Our indemnity reads as follows: I am aware that cage diving, shark diving and boating are potentially hazardous activities, and I am voluntarily participating in these activities with knowledge of the danger involved and hereby agree to accept all the risks of injury or death. I further understand that by signing this document, I am releasing any claims I have against Marine Dynamics Tours (Pty) Ltd, or any other person employed or otherwise associated with them, from liability, property damage and or wrongful death arising from the boating or diving activities that I wish to engage in. I understand that I am responsible for my participation in the boating and or diving activities engage in. I understand that in the event that there is no shark activity while on a shark cage diving tour with Marine Dynamics, then a voucher will be offered. This voucher is not transferable – your name and passport number will be recorded on the voucher. Refer to above mentioned link to download the MAP to find our offices and details to the parking area. Sunscreen, bathing costume, comfortable closed shoes, warm clothing – it can be chilly at sea. Please take your SEA SICKNESS pills the night before and again two hours prior to the trip. We are legally not allowed to sell any medication. All trips are subject to weather conditions and times may vary accordingly. Upon the confirmation of any booking, it shall be regarded that the client has read and accepted all the terms and conditions contained herein. All terms and conditions are subject to South African Law & Jurisdiction. We take photographs, films and videos (including in electronic format) of our guests during the excursion, and may use such photographic, film and video material for the purpose of any advertising or brochure productions, which the client irrevocably gives his consent thereto, and without any consideration being payable to the client.